The flowers of water willow are nothing like the catkins of true willows. American water willow is a shrublike, but not woody perennial, with creeping rhizomes, often covering large areas along the edges of waterways. Flowers are clustered into headlike groups on stems arising from the upper branches; about ¾ inch long with a notched upper lip and a 3-lobed lower lip. The upper lip is light purple, rarely white; the lower lip is white or pale purple with purple markings. Blooms May–October. Leaves willowlike, narrow, opposite, sessile (stemless), 3–6 inches long. Similar species: Lance-leaved water willow (J. ovata var. lanceolata), is uncommon and grows in swamps, bottomland forests, ditches, and other wet places in the Mississippi Lowlands (Bootheel swamps). Its flowers are loosely spaced along one side of an elongated, spikelike flowering stalk; each flower is light purple with darker purple markings on the lower lip. American water willow is common on gravel bars and other stream banks throughout much of Missouri. An emergent aquatic plant along banks spring branches, streams, and rivers, less commonly along the muddy edges of ponds, lakes, and sloughs; also in ditches. 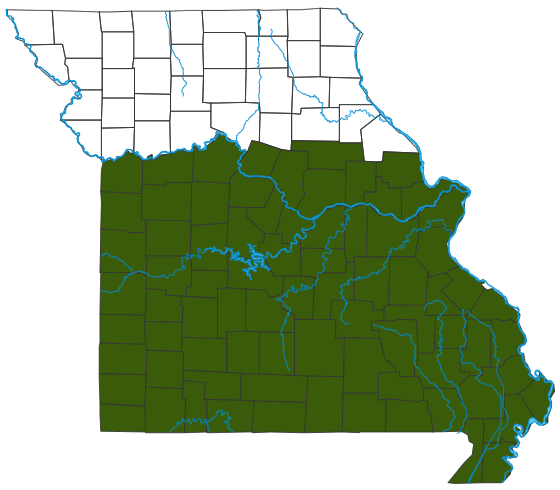 This species is characteristic of gravel bars and other stream banks throughout much of Missouri. The dense colonies of emergent stems often are unbranched and often do not flower every year. This is not a true willow; it’s just called that because of the leaf shape. Water willow’s flowers look nothing like the catkins of true willows. The family to which water willow belongs (the Acanthaceae) comprises mostly tropical species. You might have a tropical “nerve plant” or “polka dot plant” in a pot on a windowsill. Another native Missouri wildflower, wild petunia, is in this family. It is no more a true petunia than water willow is a willow. Common names can cause a lot of confusion! Plants that grow along waterways help keep streams healthy and clean, making our float trips a time of sheer enjoyment. Healthy streams also create good fisheries, which anglers appreciate. The next time you see these flowers as you glide by in a canoe, thank the plants for being there! Bees and other insects are much attracted to the flowers. Insects and some mammals eat the foliage. Like other plants that grow along waterways, this species helps stabilize banks and prevent erosion. In wetlands, aquatic plants help absorb floodwaters, protecting other areas from devastation.